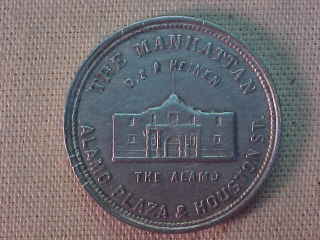 THE MANHATTAN / D. & A. HEINEN / (the Alamo) / THE ALAMO / ALAMO PLAZA & HOUSTON ST. While in architecture school at Texas Tech, I became good friends with Ray Travis *. We had things in common. We were both recently married, both worked part time to pay for school, and both liked art and architecture. Ray was from San Antonio, and I was from Ft. Worth. As we approached our thesis year, we spent many hours talking about our plans after college, etc. I noticed a military base sticker on Rays old car, and asked him about it. "My dad is in the Air Force, and that gets me into Reese (Air Force Base) to buy groceries." he said. "My whole family has been in the military. My great grandfather and grandfather were in the army, and my great-great-great grandfather was William Barret Travis." William Barret Travis was born on August 1, 1809 near Red Bank, South Carolina. When he was nine, his family moved to Alabama. William attended school, did well and studied law in college at Claiborne. He taught school on the side, to provide income. In 1828, he married one of his ex-students, Rosanna Cato, and soon they had a son, Charles. Another child was on soon on the way, and the marriage fell apart. Travis suspected his wife of infidelity, and he left Alabama, for the most promising of destinations at that time, Texas (which at that time was part of Mexico). By May 1831 he was in Texas, applying for his headright. His ex-wife Rosanna followed him and agreed to allow his son Charles to stay in Texas. Travis was living in Anahuac, Texas. The thoughts of revolutions were already abundant in Texas when Travis arrived. Mexico had embarked on a program of colonization for its vast northern regions, to encourage settlers, the laws of 1824 and 1825 had promised them ten years free of taxes, and each family received 4,428 acres of land for about $200. In return, colonists must promise to take the Mexican oath of allegiance and convert to the Catholic religion. The entire program was put under a few men, who were called "empresarios." Each empresario received a huge grant of land in return for establishing these colonies of settlers. Stephen F. Austin was one of the first empresarios. Many in the Mexican capitol feared that the growing Anglo-American expansion into Texas would prove unwise. By 1830, about 75 percent of the Texas population were American settlers. Although most Texicans believed they were guaranteed self-government by the 1824 constitution, Mexico was determined to control the northern areas from Mexico City. Some officials in Liberty, Texas were jailed in 1831, and the fuse was lit. 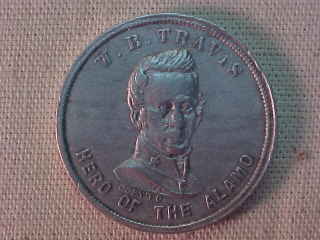 William Travis son, Charles was living safely with the David Ayers family, at Washington-on-the-Brazos. Meanwhile, Travis was becoming a firebrand in the revolution movement. He raised a company of volunteers, and forced a small Mexican garrison to surrender. General Santa Anna controlled the Mexican army from Mexico City. He sent (his brother-in-law) General Perfecto de Cos to Texas with 400 troops. A Mexican garrison from San Antonio was sent to Gonzales to confiscate a small 6-pounder cannon from a militia there, and met with 18 armed men. The 6-pounder cannon spewed old horseshoes and nails at the Mexican soldiers, and they ran back to San Antonio de Bexar. The war was on. On Oct. 13, 1835, Stephen F. Austin led 500 militiamen with the old 6-pounder cannon on a march to throw General Cos out of Texas. Their flag was a white cloth with a black star at the top, a black cannon in the center and the neatly printed words: "COME AND TAKE IT" at the bottom. General Cos waited at Bexar. The Texas arrived, surrounded the town, and waited him out. By Dec. 9, 1935, General Cos had had enough, surrendered and agreed to retire south of the Rio Grande under parole. As might be expected, Santa Anna was furious. Santa Anna had left Mexico City on November 28, 1835 heading north, organized his forces at San Luis during December, and reached Saltillo on January 7, 1836. His forces amounted to 5,500 seasoned troops, 1,800 pack mules, 33 huge 4-wheel wagons, and 200 two-wheel carts drawn by oxen. This was the force that would assault the Alamo mission by the end of February. The old mission San Antonio de Valero (the Alamo) was secularized in 1793, and its lands dispersed among the mission Indians and refugees. The old mission had been built in 1750, but years of neglect had left the chapel without a roof, and the mission in ruins. A central plaza about a city block square was at the center, surrounded by the "low barracks" on the south, and on the east by the "long barracks." The Alamo chapel itself had walls that were 4 foot thick. The chapel was the most prominent feature of the mission. 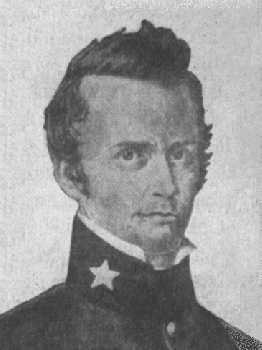 Texas Colonel Neill had appointed Lt. Col. Travis to defend Bexar, and even though Travis was only 26, he commanded the likes of Jim Bowie, and Congressman David Crockett (who was near 50). The militia groups milled around the town of Bexar, waiting for the arrival of the first of Santa Annas troops. This occurred around midday on 23 February, when the bell tower warning rang out. About 350 of the Mexican calvary had appeared on the outskirts of town. Travis and the rest of the Texans quickly went into the mission compound. As more Mexican troops arrived, the bombardment of the mission with cannon began. The two Mexican 9 pounder cannons and the 5 inch howitzer rained down fire on the mission. On occasion, the Texicans would fire their 18-pounder cannon back. On the evening of 24 February, Travis would sit down and write a short letter which would go out with messenger Albert Martin asking for reinforcements. This letter is one of the more moving documents in American history. I am besieged by a thousand or more of the Mexicans under Santa Anna. I have sustained a continual bombardment & cannonade for 24 hours & have not lost a man. The enemy has demanded a surrender at discretion, otherwise the garrison are to be put to the sword if the fort is taken. I have answered the demand with a cannon shot, and our flag still waves proudly from the walls. I shall never surrender nor retreat. Then, I call on you in the name of Liberty, of patriotism, & of everything dear to the American character, to come to our aid with all dispatch. The enemy is receiving reinforcements daily & will no doubt increase to three or four thousand in four or five days. If this call is neglected, I am determined to sustain myself as long as possible & die like a soldier who never forgets what is due to his own honor & that of his country. On 27 Feb., Travis had sent Jim Bonham to Goliad to ask for help, with orders to return. Bonham made the trip, and returned at a full gallop into the mission on 3 March, around noon. A few hours after Bonham rode in, thousands more Mexican troops marched into Bexar from the south. Forseeing their deaths, Travis drew a line in the sand, and said, "Those prepared to give their lives in freedoms cause, come over to me." The only man who did not cross, and who left the mission on that day was Louis Rose. The flag that flew that morning over the mission was the blue silk banner with gold fringe of the First Company of Texas Volunteers from New Orleans. The flag proclaimed "God and Liberty" under a flying eagle. At 5 AM on the morning of 6 March 1836, there were about 197 individuals inside the mission. The siege had lasted 13 days. By this time about 2,400 Mexican troops surrounded them, in four well placed columns. The attack was well planned, 1,800 troops of the 2,400 would make the attack at 4 AM. By 5 AM, Santa Anna had not given the bugler the order to sound the attack. Suddenly some of the Mexican troops began shouting, and Santa Anna gave the order to sound "Deguello." Of the 70 plus bugle calls in the Mexican army, the "Deguello" was the one known by all the troops. It was the call for no quarter to the enemy. As the bugle sounded, the troops rose up to their feet and closed the 200 remaining yards to the walls. Each regiments bugler picked up the call, and repeated it, over and over. As the Mexican soldiers reached the foot of the walls, Travis leaned over and fired the shotgun at them. A fusillade of musket balls flew around him, one striking him in the head. Travis dropped the shotgun over the side, went limp and fell backwards into the compound, rolling down a dirt embankment. The Alamo defenders were no match for the Mexican troops, as they were beat back and retreated inside the long barracks to make a last stand. The Mexicans trained a captured cannon on the doors of the barracks and pounded them furiously. They stormed the rooms of the barracks one at a time, bayoneting any survivors and lifting them from the ground on the ends of their muskets. About 600 of the Mexican forces died in the assault. Of the 197 Texans inside the mission, 183 defenders died, and 14 non-combatants were spared. Among those defenders, were David Crockett, James Bowie (of Bowie knife fame), Juan Seguin and James Bonham. The later loss of 390 Texans at Goliad surpassed the Alamo in casualty numbers, but lacks the image which the Alamo defenders present. The final resting place of the Alamo defenders, is memorialized by the stone cenotaph (monument) which is today located near the front of the Alamo Shrine. The bodies of all but one of the defenders were cremated in mass by the victorious Mexican army. The familiar building front that most people recognize as "the Alamo", is the chapel, and houses artifacts pertaining to the heroes of the Alamo battle. The buildings and grounds are owned, and maintained by the Daughters of the Republic of Texas. Today the Daughters of the Republic of Texas care for the shrine without accepting city, state or federal funding, and without charging admission. No photography is allowed inside the Alamo Shrine. The captured Alamo flag of the New Orleans Volunteers is stored in Mexico City, not on public view. On 21 April 1836, forty-six days after the fall of the Alamo, General Sam Houston led less than 800 men to defeat Santa Annas army of 1,500 troops at San Jacinto. Santa Anna was captured with only 9 men lost on the Texas side compared to 630 Mexican troops. Texas was free. A new republic was born. * I have changed the given name of my classmate to protect his privacy. Reference: "A Time to Stand" by Walter Lord; "The Story of the Alamo" by the Daughters of the Republic of Texas; "Traces of Texas History" by Daniel E. Fox; "David Crockett, The Man and the Legend" by James Atkins Shackford.